Anmore is a village in the Vancouver Metro area, north of Port Moody, British Columbia. Anmore is named for early homesteader F. J. Lancaster’s wife (Annie), and daughter (Lenore), their combined names forming “Annore” later evolving into “Anmore”. In 2006 Anmore had a population of 1,785. Anmore is one of three politically independent villages in the Vancouver area, with populations of under 2,500, the others being neighboring Lions Bay and Belcarra. Anmore lies along the shores of the Indian Arm, a steep-sided glacial fjord formed during the last ice age. Anmore is just 15 minutes northeast of Coquitlam. The goal of the Anmore townspeople is for the area to remain semi-rural. Residents gave vocal opposition back in 1978 when plans were presented to grow the population to 15,000 residents. Resistance to the idea of explosive growth has been successful. Buntzen Lake, a popular swimming beach and recreational area in located in Anmore. The lake is aso used to power hydroelectric stations on Indian Arm. There are two main roads in Anmore. Sunnyside Road runs mainly north-south. East Road comes into Anmore from Heritage Mountain, running north-south for about 4 kilometers before turning east-west until it meets Sunnyside Road.These two main streets in Anmore both terminate at Port Moody. Anmore is connected to the TransLink public transit system providing easy access throughout the Vancouver Metro area. Anmore is primarily a community of single-family homes with affordable listing prices. However, a fabulous 6 bedroom, 6 bathroom home with approximately 6,700 square feet might have a listing price with seven figures. Lots upon which to build a custom home are also available in Anmore and listing prices vary depending upon the lots location and size. 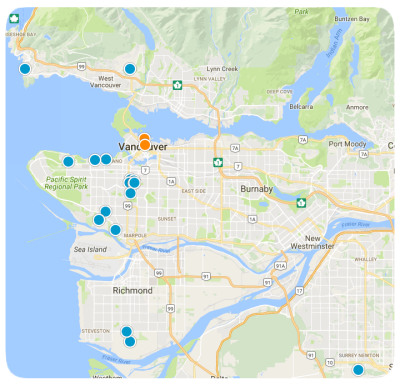 Condominiums and townhomes are not available in Anmore, but can be found elsewhere in the Vancouver Metro area. Contact us today with any questions or to schedule an appointment to see one of our magnificent properties in Anmore or any community in the area of Vancouver, British Columbia.